How would you define fashion's role in today's political climate? I can only say for myself, I can’t speak for the fashion industry as a whole for what they should and should not do. I know the calling on my life is a lot different than my peers and the fashion industry. I know that I've been given this platform to have a voice, not necessarily to just be selling clothing. I can really only speak to my convictions on what I’m here to do and not really speak to the motives or responsibilities of any other fashion houses. With your Special 1987 collection and MLB All-Star pop-up, you've taken the relationship between fashion and sports to a whole new level. In what direction do you think this bond between sports and fashion will go next with the brand? I think I learned a lot with the 1987 collection. I was really trying to educate my consumer on, you know, where the black and white sneaker came from. A lot of my consumers have references that just go back to the early 2000s and don’t know that the Celtics of the ‘80s—the whole team—wore black sneakers with white laces and that was before there was a fashion sneaker. So I was really trying to educate my consumer on the colorway and why we chose the colorway, as well as giving them further insight as to why it really works in fashion—because it worked so well with a team that was wearing green and white. Celtics were able to clash their uniforms with a black and white sneaker that has proven, through time, to go with anything in your wardrobe. I’m trying to tell that story and I think I went a little bit too far with the 1987 collection. I’m learning how to tell my story and stay within the parameters of what my design language is. So I’m learning how to tell these stories and still how to stay within the design language of who I am and what I represent. And I was happy I was able to do those things. You've outfitted Kendrick Lamar for his DAMN. tour & Janet Jackson's ‘Unbreakable World Tour.’ How do opportunities like this come across your table? 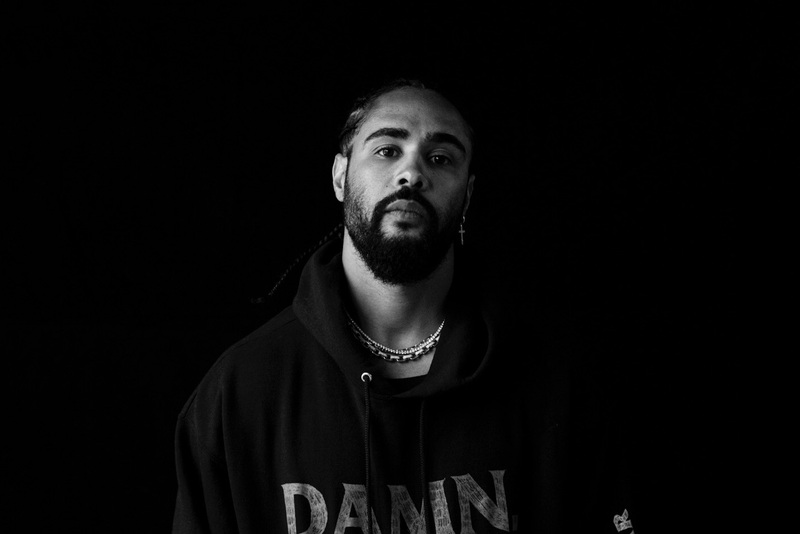 Will we see more of Jerry Lorenzo the stylist for music tours in the future? They come across simply as the way you questioned it. I think it is all about having the right product in the market in the right moment. Kendrick and his stylist Dianne liked our tracksuit and he was looking for something comfortable but still fashionable. I think that’s what we are as a brand: we’re this California, comfortable yet chic clothing line and he was looking at something like that for his tour. Dianne and I got to brainstorming and came up with taking this and putting it on this “Bruce Lee” colorway which helps further position this “Kung Fu Kenny” character. It’s not too much of a grandiose strategy to align with Janet or Kendrick, it’s just really having the product at the right moment. Fear of God is one of those brands that blur the line between streetwear and high fashion. Where do you feel this wave of luxury streetwear is going to next? I feel like it’s going wherever we take it. I understand my position in fashion is to disrupt it—that’s what I’m trying to do. And I think the more trouble that they have categorizing us or putting a title on us, the better it is for us. You know the moment that they can box us in and package us as this, they have figured out who we are. So I’m trying to continue to be disruptive where they will always be trying to catch up to what it is that we’re doing. I think it’s being comfortable with understanding that we are in the forefront of this, being comfortable understanding our calling is to disrupt it and then creating strategies and products that align with that. LA is a place you call home. How important is it for you for the industry to fully realize Los Angeles's potential as a vital fashion city? Not at all important. It’s important for me to be in LA because my family is here and I don’t like to travel. I like to sit above my production. I don’t sketch and we don’t make tech packs and send them overseas. Everything we do is by hand and in 3D so it’s necessary for me to be above my product. I wish I had a plan to put LA on the map, but it’s really a selfish desire to be able to sit above my production and see it from A through Z and not having to hop on a plane and do it overseas. I think that’s a testament to the factories that we have here and the workers that we have here. I believe we can put our sewers against Italy, Paris, Japan, wherever you consider the best construction—LA is right there with the best at this point. What has been your toughest moment of the year? The toughest moment for us is just shipping and producing at quantities and levels we have never had before. Our creative space has turned into a logistical space with boxes everywhere. We say we want to sell more and do more, then when we see the physicality of it. I wouldn’t want any other problems but not only do I design everything but I’m the CEO of this self-invested company, so a lot of my role is not only coming up with a basketball sneaker design or digging under the Vans archives and finding this pair of strapped Vans that’s only been sampled in the past, but also a lot of it is the business side of things that people do not see. What's your favorite moment of 2017? There were some moments that caught me by surprise—like JAY-Z wearing the jacket that we gave him alongside with the release of his album. But the highlight thus far was just being able to honor my dad and the black baseball players the way that I did during the All-Star Game in Miami. We still have some time in the year left. We got our end of the year pop-up shop with Maxfield coming up that we hope to outdo last year. Six pairs of Vans dropping first week of November. I think it’s probably going to drop around the same time. We may be one of the first brands that will be selling a $1,000 USD sneaker and a $100 USD sneaker at the same time. If there’s something to be said of being able to impact and reach at that lower tier and higher tier, we’re trying to continue to do that.